Sagada isn’t your ordinary island destination, and will give you a much different taste of what the Philippines has to offer. It is located high in the spectacular Cordillera mountains. The native people are different in culture than the rest of the country, strongly rooted in times long before than the Spanish era even began. Book our pre-made Sagada package, or build your own custom one, and we will make sure you’ll get to do everything you wanted to. Exploring the burial caves and the hanging coffins, and hiking in the mountains and rice terraces are among the activities waiting for you. Sagada offers a wide selection of accommodation options, most of them are rustic and simple. In our opinion, simplicity suites the nature of this small town in the mountains. Check out our list of hotels, carefully selected to fit your budget and needs. We keep our catalog as short as possible, presenting only the best hotels and making your choice easier. If you couldn’t find what you were looking for, just contact us and we’ll find the best hotel for your needs. We are certain you’ll find the best hotel in Sagada. Flights : No flights are going to Sagada at the moment. Bus : There is a direct bus from Manila, and many other buses going through either Baguio or Banaue. Read below for more details on how to get there. Getting around : there aren’t many jeepneys or tricycles so expect to walk quite a bit if you don’t want to take a taxi. Best time to visit : November to April is good all over. May to October is the Rainy season, and landslides occur regularly. June and July are still fine, but avoid visiting in August-October. No matter what time of the year you visit, remember to bring some warm clothes! the temperatures here can drop pretty low, especially at night. Attractions : Spelunking, hiking, nature, rock climbing, great food, backpacking. Local festivals and holidays : Begnas, a traditional ritual for successful rice harvest, happens three times a year around the months of March, June and November. Exact dates are only decided few weeks before the events. The locals in their traditional Igorot clothes, march and dance right after making a holy sacrifice in the rice fields. It is a rare opportunity to witness an ancient, dying tradition. Unfortunately, there are no commercial flights to the mountain province. Getting to Sagada can be done either by private vans or public transportation. When booking the package through us, you can choose to use either, and you’ll receive our full assistance and support. Coda Lines provides the only direct service from Quezon City, Manila. Their tickets run out very early, so booking ahead of time is a must. It is the most convinient way, though it is somewhat longer, and takes 11-12 hours. If you didn’t make it on the Coda Lines, there are two alternative routes that can be taken: Manila-Baguio-Sagada or Manila-Banaue-Sagada. Traveling via Baguio is slightly more popular, as it is a bit shorter, and the window view is spectacular. From Manila there are several bus companies that will take you. The two prominent ones are Victory Liner and Genesis Bus. They both have terminals scattered around Manila – in Pasay, Cubao and Caloocan. There are a buses leaving hourly, and Victory Liner is actually operating 24/7. We suggest taking the night bus if possible. It takes around 5-6 hours to get to Baguio from Manila during the night, and 6-7 hours in daytime. There are two bus companies departing to Sagada (there are 5 trips in total), starting at 6am until 1pm. The trip takes around 5 hours, so arriving in Baguio early in the morning will ensure you’ll get to sagada in a reasonable hour, and get to see the view of the road at its most beautiful. You can either take a jeepney or a mini-van from Banaue to regional capital Bontoc (around 2 hours), and from Bontoc take another jeepney (around 1.5 hours). If you’re lucky, and leave early enough of course, there are direct jeepneys from Banaue straight to Sagada. In any case, when departing from Banaue, leave early in the morning, because public transportation stops early. Sagada is all about two things, nature and tradition. The town is located high in the mountains, So it’s very different from the coastal areas. The people who live there are mainly the Igorot, the genuine people of the Philippines. They still carry their ancient tradition, which predates the Spanish occupation of the country. All tours and attractions featured below can be booked individually, or simply added to your full Sagada package. We can either team you up with a group, or launch a private tour just for you – it only depends on your preferences and exact requirements. Most of the attractions in Sagada are close to the town’s proper, and that’s a huge plus in the Philippines. All of the tourist spots are just a walking distance from the center. 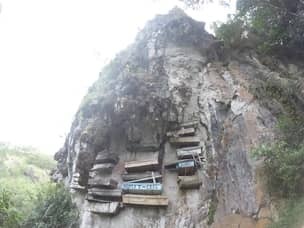 The most famous thing to see in Sagada are the hanging coffins, an old burial method where only the respected members of the community were put in a coffin that was then hanged on the cliffs of Echo Valley. Caving is very popular in Sagada, especially in Sumaguing Cave, where you climb, swim, and rappel to the inside of the cave and its wonderful rock formations. Other caves like Crystal and Balangagan are even more extreme, but less popular with tourists. For a different cave experience, visit the Lumiang burial cave, and the 200 coffins inside, some of which are over 500 years old. You shouldn’t miss the sunrise in Mt. Kiltepan. It is a matter of luck but if the weather is not foggy you will see the sun rising from what is called the Sea of Clouds. Don’t expect to be the only one on the mountain. Many tourists try their luck and hire guides to take them, leaving town at 4am just to get to the mountain before sunrise. There are many More beautiful treks Sagada. 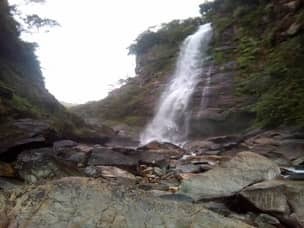 Pongas waterfalls, lake Danum, Bumod Ok falls and Sagada’s rice terraces are all perfect examples of that. You will never go short of spectacular treks and hikes, where you unite with nature. Rock climbing is easily accessible, with guides and gear. It is not always easy to find in the Philippines, so if you are a climber, this is your place. How does Sagada fit into my schedule? By visiting Sagada and its neighboring spots, you will get a taste of the Philippines that not many get. It is a good chance to expand your experience to more than just beautiful islands and beaches. Sagada will easily fit your schedule if you are planning to visit the north of the Philippines, or at least its mountains. We highly advise to combine Sagada with other destinations like Banaue and Vigan City. If you chose to visit Sagada, you must be really into hiking and nature. In that case, we strongly recommend you check our hiking packages – Let us plan your entire trip and make it full of beautiful scenery and memorable treks. A lot of people spend some time in the north before heading south to relax in one of the many beautiful islands, so that is another plan of action you can certainly consider. All you have to do is check our list of most beautiful islands and beaches, and add the ones you like most to your wishlist. We’ll figure out how to combine them into your itinerary in the best way, to save the most time and money. Sure, we’ll send over a package by mail. Thank you for leaving a comment!